California poppies supplying their own sunshine in this burnt orange cluster growing wild along the Galloping Goose trail. Like digitalis, they move themselves around. I'm writing this on day three of summer solstice, the time of year when we get the maximum of daylight hours. By rights we should be enjoying long warm evenings out-of-doors, but in the cool 'Junuary' weather we're having, as often as not evenings are spent inside, if not hovering near a heater. The plants, however, oblivious to our complaining about vile weather, are quietly enjoying moist soils and moderate temperatures, giving us long flowering and lush foliage. Their floral display offers at least some consolation for our feelings of abandonment by the sun. This time of year so many things are blooming in tandem, from mop-headed peonies to blazing poppies to cool blue ceanothus, and so many more readying themselves in the wings, that it's rather arbitrary to single out any one plant out for promotion. And yet, I just have to sing the praises of one humble cottage garden plant that's a favourite performer, reliably adding its unique character to our late spring gardens. 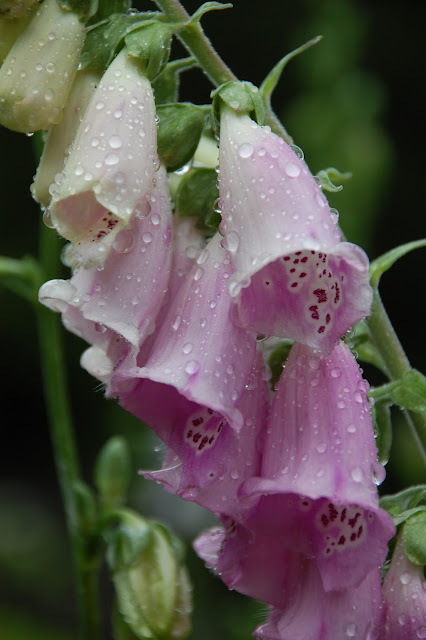 I'm talking about foxgloves (or digitalis). Foxgloves bloom along a tallish spike, in a range of magenta-pink and clear white colours. Frequently an uninvited garden guest, showing up unbidden after soils are dug over or winds disperse their tiny seeds far and wide, foxgloves lend charm with their novel vertical presence. Should they appear in your garden, afford a few of them a smallish footprint and they'll reward you next year by stretching upwards and ‘inspiring’ novel effects. 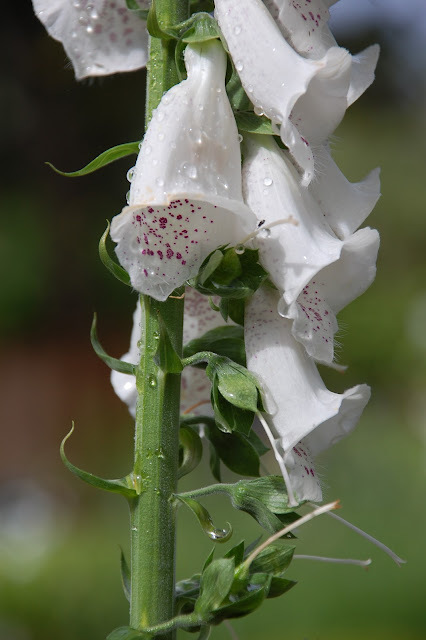 In the flowering portion of their cycle, at their maximum height, foxgloves claim a realm that's typically unused unless occupied by the more permanent shape of a shrub. Unlike shrubs, after flowering (and with a little help) they retreat to a base that's compact and recede into the background. Should they fail to arrive spontaneously, you have only to scatter a few seeds where you think you think they might contribute to the scene. The common foxglove (digitalis purpurea) is absolutely the best in my view, as it's an easy-care, drought-hardy plant - but I must admit my bias towards the less-bred, more-common varieties of plants. Not uniquely though, as I can sometimes be seduced by a plant that's well-bred too! A range of blush magenta tones show up spontaneously, with dark-purple spots inside. Foxgloves are to my eye the perfect plant for gaining vertical effects from a compact space – they will tuck quite handily into small niches. Sometimes this dwarfs them a bit, but what matters to me is the effect in a given situation. 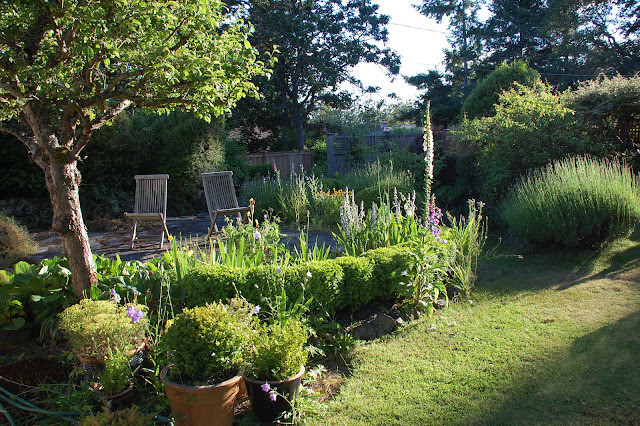 Most of our gardens are not huge, and they tend to fill up because we're such collectors, so space is often at a premium. These magenta-pink or white-flowered biennials (with varying blush tones in between) send spires as high as six feet from their compact rosettes. Elegant as singles, they also cluster well in small groupings. Foxgloves add vertical dimension to the garden, sending their spikes up into airy voids and draping them in elegant, delicate flowers. Unpredictably, some foxgloves are clear white. Here a volunteer attains its full height of six feet. Foxgloves feel 'old-fashioned' because they've been around for such a long time, valued both ornamentally and medicinally in Europe. Additionally, they are great attractors of bees, butterflies, and most dramatically, hummingbirds, who love their nectar. Bees delve so deeply inside their tubular blooms as to disappear entirely from view. Foxglove flowers open slowly along the main stem, advancing from below and setting seed in sequence as petals drop off. 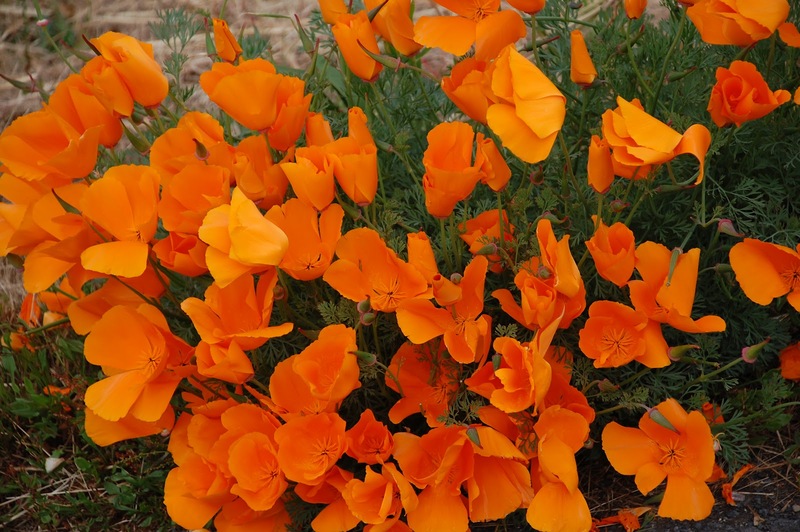 With enough moisture, they’ll easily give more than a month of continuous bloom. I rate all plants on the fussiness scale before making choices, but these hardly register. They're easy to look after because they don't mind thin soils or lack of nutrients, and they have the compelling knack of growing in some of the most unpromising locales. They also like acidic soils, which makes them apt for southern Vancouver Island with its coniferous forests. Our damp cool June has prolonged flowering and relieved us of the need to water. Foxgloves are notorious self-sowers, which in a positive vein provides gardeners with opportunities to exploit their spontaneously chosen placements (shades of Norah Lindsay!). At one level, once present in your garden, tending them involves little more than watching where they germinate and then saying yay or nay. Yes you have to control their seed dispersal, but you retain the power to edit where they've landed, keeping only those that you feel add to your composition. 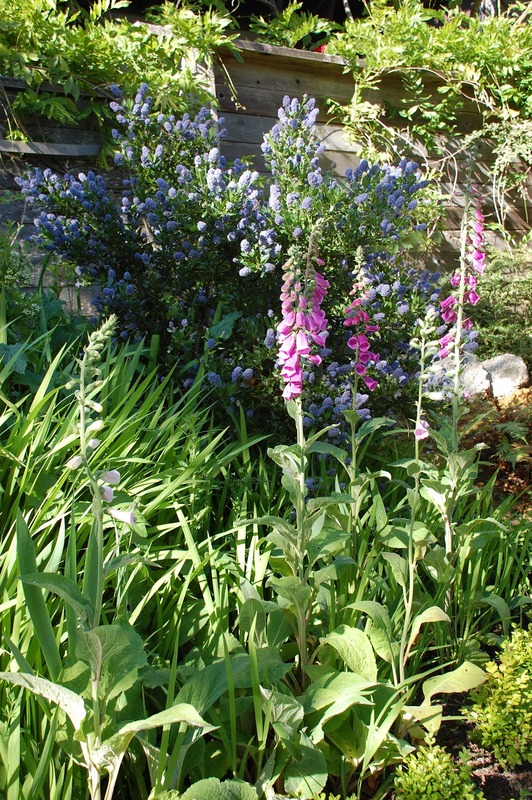 Foxgloves in a cluster, with colour variations, displayed against a perfect foil of blue ceanothus. 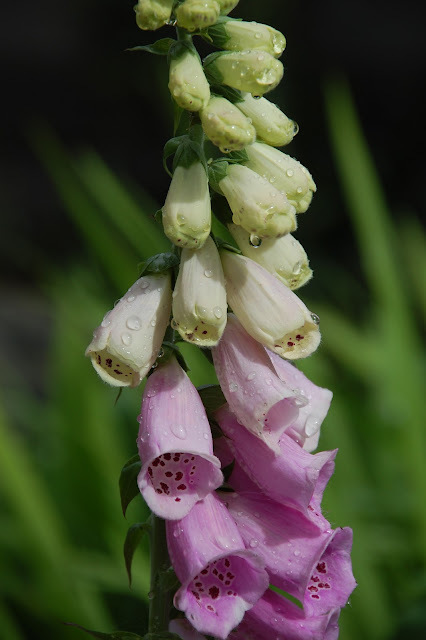 Foxgloves are an introduced plant (ie. not a native species) that has naturalized across large parts of North America. We need to bear in mind they can be space invaders, appropriating habitat from native species quite efficiently and therefore posing a threat to the viability of other plants along forest edges and logging roads. Their seeds remain viable for a very long time and lay dormant in the soil awaiting opportunity. This is not a threat in gardens where space is closely controlled, but it is a compelling reason not to be nonchalant about their seed. Flowering up their stem, they set tiny seeds in pretty capsules that belie their power to spread. To put this as a warning: foxgloves are lovely, but don't let them run amok, or they will! It’s necessary to deadhead these plants after flowering in order to control their prodigious seed output – failing that, they’ll be everywhere. And, the earlier you do the deadheading, cutting the stem back to the rosette, the more likely they are to bloom again the following year. Note though that they are biennial, flowering in the second year after germination. And here on the wet coast, they can sometimes be coaxed to be a perennial, which if they've located themselves choicely, is a real asset. Once at home in your garden, new plants will assuredly appear, because some seed scatters during the deadheading no matter how careful you are. If these self-chosen sites aren't where you want them, they're easy enough to lift and transplant during fall when plants are becoming dormant, or in early spring when soils are moist. Just remember, they don't bloom the first year - so be patient and avoid disappointment. Indeed, forget you ever transplanted them (easy enough if you're busy) and then enjoy the sense of surprise when their rosettes begin to perk up and fresh spires reach skywards. 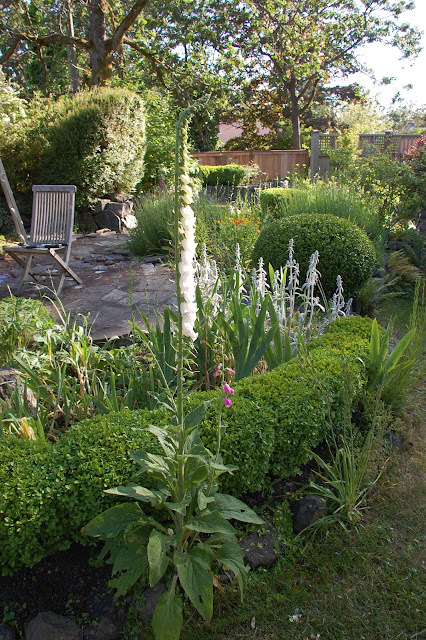 Late in the evening, on a rare sunny day, western light floods into the garden illuminating foxglove spires. Digitalis thrive in partial sunlight to deep shade, making them even more useful in the parts of gardens less drenched in sunlight (which is all of our gardens this season!). However, they will also tolerate full sun, so they are truly versatile performers. The name digitalis means 'thimble', referring to the shape of their flowers, as apparently does the 'glove' in foxglove. They do happen to be poisonous, so don't ingest them unless prescribed by a doctor (likely as digoxin, a common heart medication derived from digitalis). 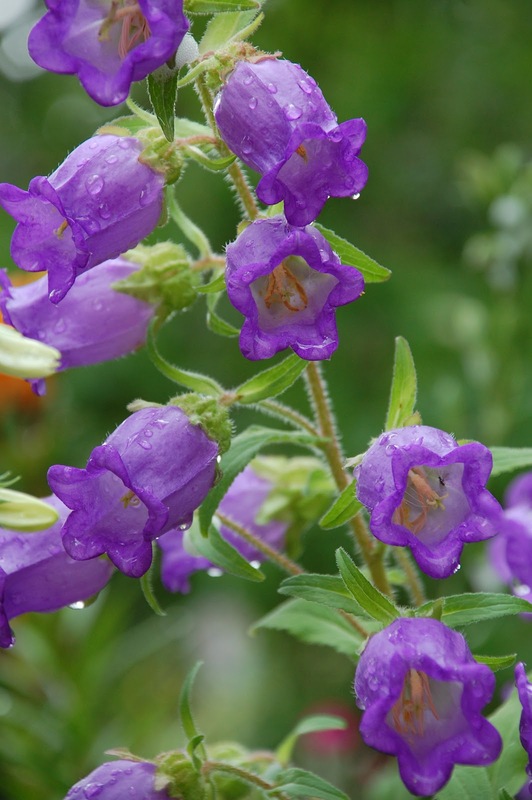 As I've wandered about observing my own foxgloves, going strong from early June well into the new solstice, I've also noticed several other self-seeding plants that are blooming: campanulas, for example, overlap the foxglove season and are going full bore right now. They are overlapped in turn by the grey, felt-leafed Lychnis (another cottage-garden stalwart), just now inching into their time of glory. 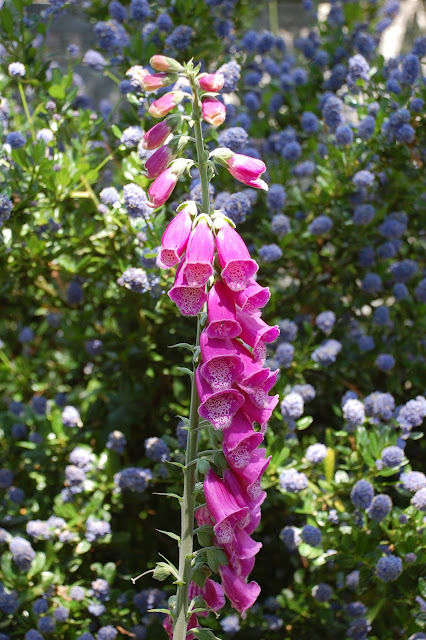 Both of these share foxglove's ability to self-seed, so beware of expansionist tendencies, but they like to gradually extend their domain in one locale more often than packing up and moving home holus bolus in the manner of foxgloves. In any case, you the gardener retain the power to edit and have the final say over where these mobile spikes of colour appear. I enjoy the fact that once sown, these plants will do most of the rest of the work all by themselves. There are many types of campanula moving around: this I believe is Canterbury Bells, a volunteer in my garden.